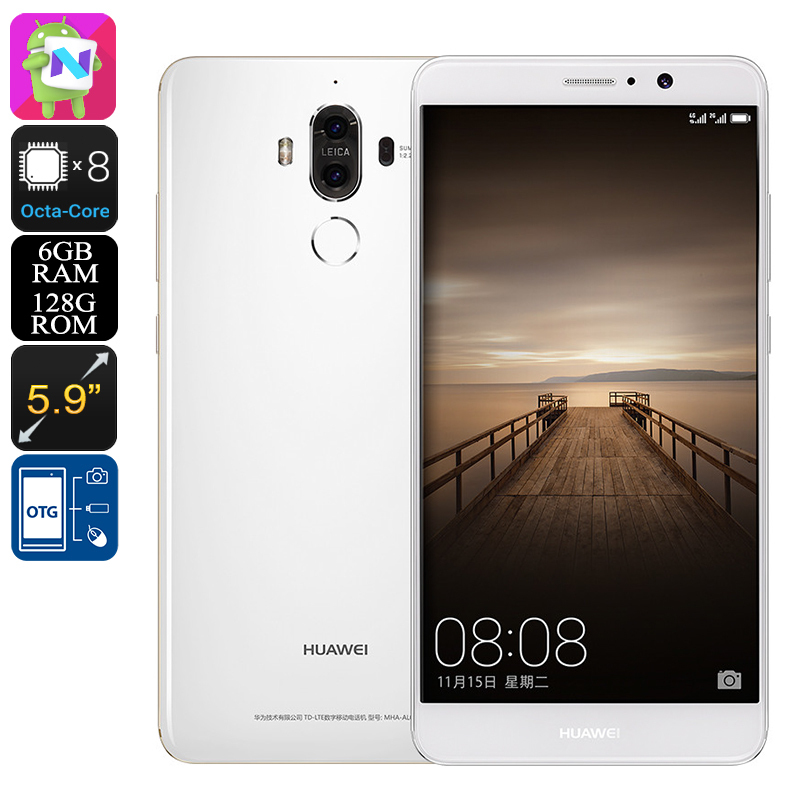 Successfully Added Huawei Mate 9 Android 7.0 Smartphone - Octa-Core CPU, 2.4GHz, 6GB RAM, 128GB Internal Memory, Dual-Camera, Dual-IMEI (White) to your Shopping Cart. The Huawei Mate 9 is one of Huawei’s latest Android phones and it comes packed with an absolutely stunning set of hardware and software alike. Running on the latest Android 7.0 operating system, you can be assured that this flagship smartphone brings along a smooth and powerful user experience – allowing you to take the absolute most out of your device. With its sleek appearance and large 5.9-Inch Full-HD display, this Android smartphone does not only provide a great user experience but also is a feast to look at. No matter your smartphone demands, the Huawei Mate 9 is a flagship device that is sure to meet your liking. Packing an extremely powerful Octa-Core CPU that features a maximum speed of 2.4GHz, this Android smartphone can be considered as a real power horse that is capable of handling whatever you throw at it. Added to its ultra fast processor this Chinese phone furthermore packs a stunning 6GB of RAM, allowing you to engage in excessive multitasking sessions without ever needing to worry about slowing down your Android device. Watch Full-HD movies, play the most demanding online games, or simply enjoy multiple of the latest features and mobile applications supported by Android 7.0 at the same time – the Huawei Mate 9 will handle it all without dropping a frame. Supporting 128GB of internal storage and offering the added possibility to throw in an additional 256GB externally, this Android 7.0 smartphone is guaranteed to offer enough storage space to store all your favorite media and files alike. Featuring two IMEI numbers, 4G connectivity, and Dual-Band Wi-Fi, this Dual-SIM smartphone bring your mobile connectivity to a whole new level. 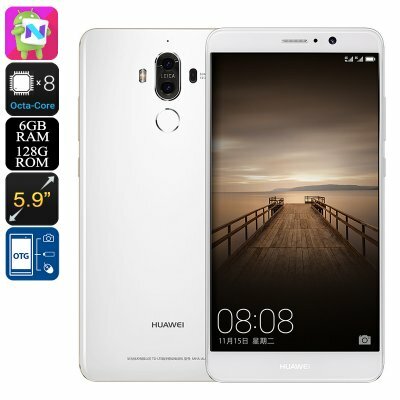 Its Dual-IMEI support allows you to be connected to two network providers simultaneously, letting you be reachable on two phone numbers while using just one device – making the Huawei Mate 9 the perfect business smartphone. Added to that the phone’s 4G connectivity and Dual-Band Wi-Fi allow you to browse the web at lightning speeds wherever you are. No longer will you experience any lag while trying to stream a movie, download an app, or play an online game as with the Huawei Mate 9 Android phone at your side a laggy internet connection will be an issue of the past. What really sets this flagship Android smartphone apart from its competition is its remarkable dual-lens rear camera that allows you to shoot the most beautiful and breathtaking images and video at any given moment. Featuring both a 20MP and 12MP lens, this Dual-Camera lets you take your mobile photography skills to an entirely new level. No longer will any special moment in life pass by uncaptured as with this camera in your pocket you have all the means necessary to shoot 20MP pictures and stunning 4K video whenever you want. The Huawei Mate 9 comes with a 12 months warranty, brought to you by the leader in electronic devices as well as wholesale electronic gadgets..
Arabic: - 6 بوصة الروبوت الهاتف - Chinese Simplified: - 6 英寸的 Android 手机 - Czech: - 6 palců Android telefon - Dutch: - 6 inch Android telefoon - French: - 6 pouces de téléphone Android - German: - 6-Zoll-Android-Handy - Hebrew: - 6 סנטימטר אנדרואיד טלפון - Hindi: - 6 इंच एंड्रॉयड फोन - Hungarian: - 6-os Android telefon - Italian: - 6 pollici Android Phone - Japanese: - 6 インチの Android 携帯電話 - Korean: - 6 인치 안 드 로이드 전화 - Malay: - Telefon Android 6 inci - Norwegian Bokmål: - 6 tommers Android telefon - Romanian: - 6 inch Android Telefon - Russian: - 6-дюймовый экран Android телефон - Spanish: - Teléfono Android de 6 pulgadas - Thai: - โทรศัพท์มือถือ 6 นิ้ว - Turkish: - 6 inç Android telefon - Vietnamese: - Điện thoại Android 6 inch.